Wes Carver returns to his hometown—Black River, Montana—with two things: his wife’s ashes and a letter from the parole board. The convict who once held him hostage during a prison riot is up for release. For years, Wes earned his living as a corrections officer and found his joy playing the fiddle. But the riot shook Wes’s faith and robbed him of his music; now he must decide if his attacker should walk free. With “lovely rhythms, spare language, tenderness, and flashes of rage” (Los Angeles Review of Books), S. M. Hulse shows us the heart and darkness of an American town, and one man’s struggle to find forgiveness in the wake of evil. S. M. HULSE received her MFA from the University of Oregon and was a fiction fellow at the University of Wisconsin–Madison. Her stories have appeared in Willow Springs,Witness, and Salamander. A horsewoman and fiddler, she has spent time in Washington, Montana, Idaho, and Oregon. One of the Seattle Times's "Best Books of 2015"
"This Montana-based story, about a prison guard who returns to his hometown after decades away, is an intricate work that layers faith with broken promises, broken bones, and broken hearts. This is a story of people shaped irrevocably by place and circumstance. "—Seattle Times, "Best Books of 2015"
"The prose in S.M. 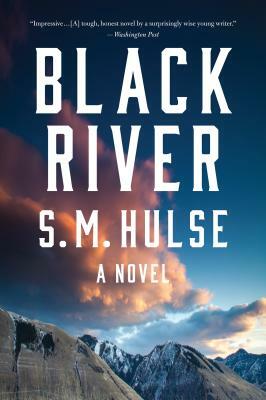 Hulse's debut novel Black River mirrors the Montana land in which it's set: spare, powerful, and dangerous. This is a novel about love born from violence, about families torn apart by tragedy, and about a community that must take a long, hard look at its past if it's ever going to see its future. Like Kent Haruf and Larry McMurtry, S.M. Hulse knows the landscape about which she writes, and she understands the hearts of those who live there." "Hulse writes with great clarity and precision, her language a celebration of rigor and intensity, and with such awareness of human rage and love—and fear of love—that her novel Black River feels like a river itself, teeming and unexpected and driven. She has an amazing sensibility for creating the understated, the emotionally-pressurized, the contained-and-explosive, the unsaid-and-impossible-to-say. One of the great joys of reading this novel is watching how she manages this—and how her perfect balance allows her deeper and deeper insights into the ways that people, especially men, negotiate their love for, and their fear of, each other and themselves." "Like her forbears Kittredge, Proulx, Carlson, Hulse examines the mountains and rivers of the west, its implacable beauty, and makes the landscape her own. In Wesley Carver she has made a mountain of her own, fashioned and then refashioned by the forces of memory, bitterness, and finally, forgiveness. A wonderful debut by a welcome new voice." "A lovely austerity infuses this story of damage and redemption, and makes it glow. Hulse is a wise and compassionate writer who understands the tricky and heartbreaking borders between principle and rigidity, justice and revenge. Her debut novel is provoking and memorable."